Yesterday was one of the best Wednesdays I’ve had in quite a while. My work day flew by (for the most part) and at 3:30, I was changed into my gym clothes and practically running out the door to get to the gym. The reason? Well, I read Ali’s blog every day and she is the NYC queen of fitness classes. She’ll do Chisel followed by Spinning, all after a long day at work and a 5am run. Seriously, I want to be her. So I got myself motivated and chose my class of the day: Barbell Pump. 60 minutes of muscle-conditioning goodness. The type that provides a special genre of soreness, one I am feeling right now. But it was awesome. The instructor is tough, but hilarious and I think we did lunges and squats for a straight 20 minutes without stopping. I was short on time because of my night’s plans so when I got to the gym at 3:42 (class starts at 4), I quickly set up my area and got in a quick 10 minutes of cardio on the treadmill. I ran a fast 9:05 mile (READ: I’ve never run a mile that fast EVER IN MY LIFE) and rounded out 10 minutes for a solid sweat. And oh yes, was I sweating. The sweat continued throughout the muscle class and I left the gym feeling accomplished and worthy of my Wednesday night treat: Pinkberry and So You Think You Can Dance with my DanceWorks Boston Wednesday night friends. After a speedy shower and even speedier dinner (Weight Watchers Ravioli in Marinara… a delicious 7 PointsPlus investment), I was out the door and on the train to Newbury Street to meet up with the ladies. 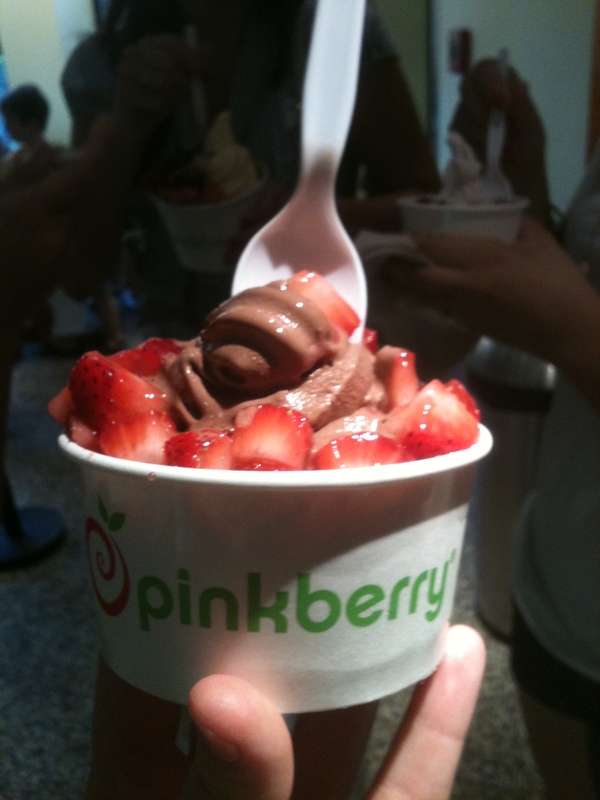 Pinkberry = Perfect frozen (guilt-free!) treat on a warm summer night. Chocolate fro-yo with lots of strawberries. We then headed back to Lisa’s beautiful apartment to watch some quality dancing. A little DWB Project, a little So You Think You Can Dance… what’s not to love? I gotta say… Melanie from this season is my absolute favorite. All of the contestants this year are really talented and there aren’t any obvious weak links so I think kicking people off is going to be harder and harder each week. All of the dancers have incredible technique but Melanie stands out for me. Question: Do you watch SYTYCD? Who is your favorite this season? And what’s your favorite routine this far? Mine is a 3-way tie between Melanie and Marko’s stone contemporary dance from week 1, Melanie and Marko’s lyrical-hip hop last night and Caitlynn (my other favorite girl) and Mitchell’s lyrical (with the chairs) from Week 2. After a spectacular night in Boston, I took the train home, reviewed some NDA material and hit my bed hard. Sign of a good day. I also decided I want to open a Pinkberry near my house because the closest one is in Boston and that’s just a tad too far to drive for fro-yo. Who wants in? Lisa loves…MELAAAAANIE! (third person statement).